Ancestor Stones, by Aminatta Forna. New York: Atlantic Monthly Press, 2006. A gifted writer recreates the stories of four West African sisters whose lives span the twentieth century. As the twentieth century begins, a West African man clears land and starts the coffee plantation that will make him wealthy. Four of his daughters, by four of his eleven wives, tell their own stories about their lives as children, coming of age, in maturity, and in old age. The stories are told to a niece who grew up among them and now lives aboard, a woman who could be Forna herself. When the niece returns to the plantation, the aunts are waiting to tell her their stories. In one of the stories, a young girl watches her mother take up a cluster of stones that she obviously cherishes, and shake them out on the floor. A dark rock the shape of a man’s cigar. A broken pebble, open like a split plum. A stone with a dimple that fitted my thumb. A pale three-cornered stone…. The Ancestors, she called them…. The names of my mother’s mother. Of my grandmother. Of my great-grandmother and her mother. The women who went before. The women who made me. Each stone chosen and given in memory of a woman to her daughter. So that their spirits would be recalled each time the stone was held, warmed by a human hand, and cast on the ground for help. 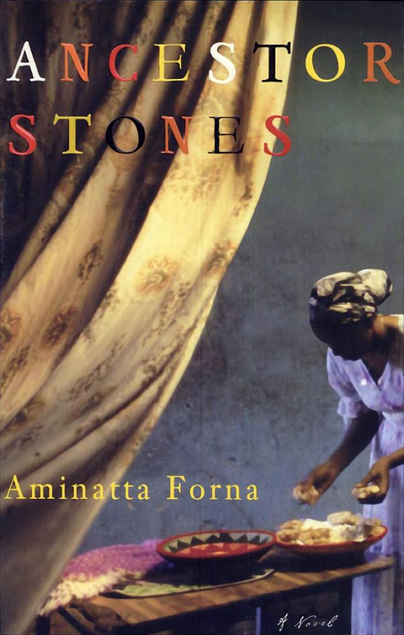 In Forna’s hands, stories are “ancestor stones,” each a jewel in its own right, but even more meaningful in the context of the others. They recount how lives were lived in the past, but not with the intention of preserving particular traditions. Instead they are meant to deepen our understanding of the choices we all face as humans. All of them affirm life in face of pain. The first set of stories in Ancestor Stones tells of life in a large polygamous family. We see how it works and how it breaks down. Rivalry and support among the wives co-exist. Children find nurturing from various “mothers,” and wives are driven away. Traditional religions are being replaced by aggressive Islam. The man at the head of the family is a Muslim, and he expects all of his wives to share his faith, but they continue to worship in their own ways. The second set of stories is about the women’s experience as they leave the compound to marry, to attend school or to work for the white men who are arriving. Seeking to live differently than their mothers, they find themselves unable to do so. They relate the pain of traditions, like female circumcision, but accept it as “the way things were.” Yet their worlds are changing. Europeans, who are appearing, seem to make tasks harder for themselves. For example they carry books in their hands instead on their heads. New houses are square, not round, and harder to keep clean and free of spirits. Next are stories in which the women have matured and face new problems. One marries a man who becomes a leader in their newly independent country and becomes part of glittery society in the capital. She recognizes that something is wrong that no one wants to admit. Another goes to England to study where isolation almost destroys her. The daughter of a man from Sierra Leon and a Scottish woman, Forna lived in Sierra Leone as a child and left after her father’s death. Today she moves between there and London. For this book, she learned her people’s native language in order to collect family stories. Her novel, Memory of Love, is explicitly about Sierra Leon and its attempts to recover after from civil war. The setting for Ancestor Stones is not explicitly stated. I strongly recommend this book to all who are interested in women’s lives in West Africa throughout the twentieth century and all who find joy in well-crafted prose. ← The Sacred River, by Wendy Wallace. Aminatta Forna is definitely an author I want to read. This sounds like a good one. Interesting that the women continue to practice traditional religion even though their husband is Muslim. Yes, although they got punished for not following his lead. I found it interesting that the traditional religions were pushed aside first by Islam and later by Chrisitainty. A wondeful review, thank you. I haven’t yet read Forna, although she has been on my radar for years. This review has bumped her up on my wish list. Which of her books do you recommend as a starting point? I really like her writing and think you might, too. I’d say start with this one first if you can. It gives such good context for what happened in Africa over time. I also like her Memory of Love, about the aftermath of civil war. One of her others is about her father’s death in civil war and her latest is about non-African conflict. I need to read Forna! She sounds wonderful. Thanks for a great review.